When trading this instrument, I use the binary platform at www.optionFair.com. It offers one-touch puts and calls for a wide range of options, including my favorite, which is the Euro vs. US dollar. Currently the rate is about at the 1.3000 level. Perhaps this large figure will spark a significant move in either direction. However, there is sure to be some kind of action at this level as the market decides whether it is at a resistance or support level. Let’s say that a trader has decided that it is at a resistance level now, and that any movement above that level would most likely be ‘sat on.’ In other words, it has a limited upside scope. What can the trader do to capitalize on this situation? The answer is to sell the upside one-touch call. A 77% return is provided by optionFair on this trade. If this rate is at 1.3000, a 1.3001 one-touch call level might be offered over the following one hour time period. So if the 1.3001 one-touch call is sold at a 77% return, that means that as long as this rate doesn’t make it to 1.3001, then for each $100 that you invest, you will receive $177 in return. What that means is that if you think the market is currently on a downwards path, you will be covered from the ‘noise,’ which is the small, short-term fluctuations that takes the market back up in small amounts. The seller of a one-touch call in effect has a small amount of buffer that is built into his projection. So what that means is that the one-touch seller is provided with a small amount of leeway from the ‘house, which is optionFair in this case. If you don’t have a good idea of whether the rate will be going down or up from 1.3000, but you think it is going to be volatile, you can purchase the one-touch put and one-touch call, but this trade has a particular risk. However, purchasing $100 of each puts $200 at risk. So if the lower barrier is hit after the market falls quickly, you get $177 return will a potential $23 still at risk due to the one-touch call exposure. You have the choice or either cashing in immediately or running the one-touch call and hope the underlying bounces back past 1.3000 and reaches the upper level. to receive an additional $177. As long as the one-touch call return stays over $23 you will still be in profit and still in command. It’s a lot easier controlling the position the winning position than it is having your back against the wall. There is more to binary options trading than just the Over and Under game. Traders who have a good grasp of the underlying volatility will be able to realistically take on the ‘house,’ or binary options platform by forming a superior opinion of the volatility in the market. Assessing volatility is key to successful options trading. 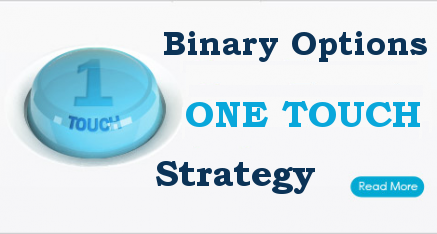 It applies as much to binary options as it does to conventional options. Having good judgment on volatility, in addition to being able to assess market direction, provides you with the ideal springboard for very rewarding trades and profits.